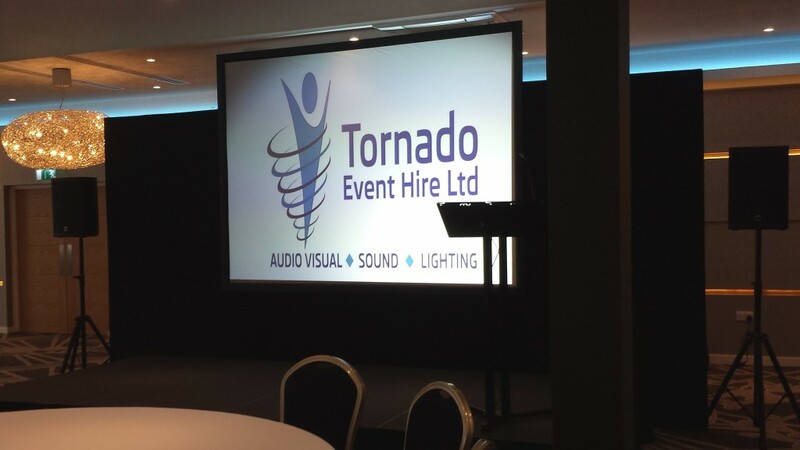 Tornado Event Hire is expert in providing audio visual equipment for your Corporate Event, whether it’s a projector for delegates of up to 50 people, or a 55″ LCD screen for an event of up to 500 people. As well as good staging, lighting and sound, the right audio visual equipment can really make your event work for you and your delegates. We can help advise on the best solution for the particular function you are hosting. Based in Hertfordshire, we are in an enviable central location, with excellent transport links, to enable us to travel anywhere in the country in less than a day. Our highly skilled engineers will install the equipment and check it’s fully functioning, so that your event goes off without a hitch. We have an extensive range of fully PAT tested audio visual equipment. The equipment is quality checked prior to, and during, installation to ensure it’s all in full working order. Our installers set up the equipment, leaving you with the task of getting your corporate message across, safe in the knowledge that the technical side is completely taken care of. 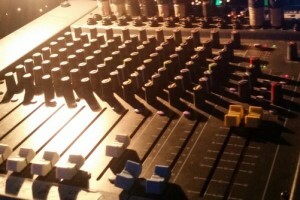 We have been hiring out audio visual equipment for corporate events for many years. Large events, hosting up to 500 people, require a strategic and coordinated approach with the sound, lighting and audio visual equipment to ensure all delegates receive the same experience. We will discuss your needs for the event and suggest the right equipment to provide for them. All attendees have to be able to see the screen and thus the positioning of the stage, the screen and the chairs is a vital part of the planning that we can help you with. We have worked with Your Move for over 15 years organising equipment hire in Scotland, London, Exeter and Manchester. A recent event was the Building Your Business Conference, where over 350 delegates attended. We provided a complete audio visual solution including: an 8’x6’ screen; supplemented by further plasma screens, which were strategically located to ensure every delegate had an uninterrupted view. Tornado Events has provided high quality professional sound, lighting and staging for numerous events over many years. The quality of the equipment is high, with continual investment in new technology, providing a highly dependable result. Jon Cooke, Managing Director, Your Move. How will every one be able to see if there are 500 people attending? We can provide you with one large screen, and smaller screens strategically positioned in the room, so that everyone has a view. Is there a time lag between screens – if so, won’t it put people off? Fortunately, technology has moved on so much in the last few years that time lags are virtually unnoticeable. 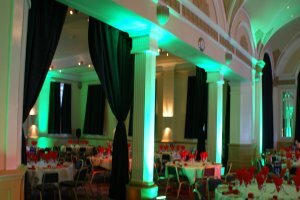 Medium-sized events for between 50 -150 delegates, require the same amount of logistical planning in terms of light, sound and audio visual equipment. Generally because there are the same issues, but just on a smaller scale. As with larger corporate events, the process involves discussions between ourselves and our clients to arrive at the best solution for the event. Tornado Event Hire has been working with Reeds Rains, Estate and Letting Agents, for a number of years. 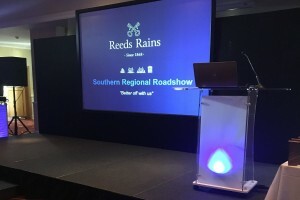 The Reed Rains Conference tours the UK every year, exhibiting in towns such as Harrogate, Manchester, Haydock, London and Leicester. Trying to fit the same show in to different venues can be challenging to say the least! After receiving the brief from Reeds Rains, we discussed any potential obstacles. These are generally resolved by ‘thinking outside the box’ to find the best equipment for the task. For example, our entire set is height adjustable which works perfectly in this scenario. We have been using Tornado Event Hire for about five to six years, and have established a really good relationship for all the events we run. 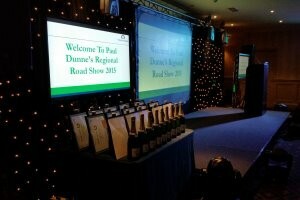 From roadshows to smaller venues, the team at Tornado has really tailored its service to what we have needed. It certainly is a brand we would recommend. Oliver Blake, Managing Director, Reeds Rains. How do I know what size screen to hire? We will talk you through the venue and the number of delegates in order to point you in the right direction for the most suitable audio visual equipment. What if the screen or projector fails during my presentation? Don’t worry we are on call and always carry a back up. As well as providing audio visual equipment for hire for medium and large events, we also can assist companies with smaller meetings. Events for up to 50 people, although more intimate, still need careful planning to ensure all delegates can glean the most from the meetings. MBDA – Shuttleworth, Old Warden, was a fantastic job to do and illustrates how we can help with smaller sized conferences and exhibitions. MBDA, world leaders in missiles and missile systems, wanted to celebrate its 100 years’ anniversary in style by hosting an exhibition for its current and past employees, a day to celebrate and recognise their tremendous achievements and journey. To supplement the exhibition, MBDA wanted to hire LCD Screens to place around the aircraft hangar. 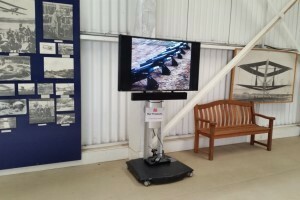 We provided 4 Screens, all on stands like the one pictured, which played videos with sound for the duration of the exhibition. I am holding a meeting for only 25 people – and I don’t want a huge, fancy screen. Can you help? Yes, we certainly can. We stock many audio visual equipment items to suit the smaller conference or meeting. Depending on the size of the event, we can set up (and take down) in a matter of hours.